It’s been nice to see all the euphoria at Yahoo about free food and Apple iPhones kicking it up a notch. But, purple people, guess what? Them’s just your basic table stakes in Silicon Valley these days and pretty much everyone else has had such perks for a long while now. Thus, as nice as it is to drink your coconut water gratis, after two months in charge, it’s long past time to focus on what new Yahoo CEO Marissa Mayer is up to besides making much-needed but obvious cultural changes at the troubled Internet giant. She’s been busy with the expected listening tour of employees and also outside tech players — such as former Yahoo CEO Terry Semel — which is a textbook stop in the turnaround playbook. Now comes the hard part: Actually beginning to make the significant decisions about how she’s going to turn around Yahoo and what the key issues of strategic focus need to be. In a series of recent meetings, according to numerous sources inside the company, Mayer has begun to outline what those are to top staff. Not surprisingly, they are many of the same thorny issues that Yahoo has been facing for a long time and which center primarily on making the company relevant again in a wide number of ways. I’ll get to many of them over the next week in a series of What Will Marissa Do? posts — including looking closely at her new hires, when and how Mayer will deal with inevitable layoff decisions facing the company, where the sale of Yahoo! Japan stands and, finally, what she’s cooking up for key Yahoo products. But the focus has to fall first of all on search and advertising, the two arenas that Mayer has been studying most closely, according to numerous sources close to the situation. That has included a recent meeting and numerous discussions with Microsoft CEO Steve Ballmer about improving Yahoo’s search advertising partnership, said sources at both companies. That deal has been largely disappointing since it was struck under the regime of ousted CEO Carol Bartz several years ago. Many reasons are given for the poor performance of the entire arrangement, including lack of improvement of cost per click and share growth for both parties. That means bid density and numbers of advertisers remain too low, especially compared to Google’s offering of access to a larger, more active and lucrative market. Simply put, despite massive spending by Microsoft on search, users and advertisers get significantly better results overall with the search leader Google. The irony abounds that it’s up to Mayer to fix this problem of improving revenue per search with Ballmer, since she has been among the executives who have made Google the search behemoth it has become. Her particular expertise has been on search experience for consumers, which is just the area that Yahoo desperately needs to improve after handing over technology duties to Microsoft. That move was controversial at the time and some feel it was a big mistake. But, most also think there is no going back at this point, given the enormous cost of running a serious search enterprise. Such an idea is still being raised inside Yahoo, although it seems more nostalgic than a realistic possibility, given the enormous price and, more importantly, the departure of the company’s core search engineers in recent years. 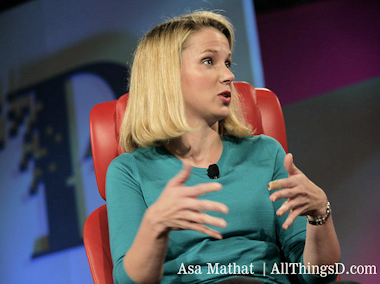 That doesn’t mean Yahoo under Mayer can’t be key to helping solve Microsoft’s search tech problems. She certainly knows the entire arena, which has already given Yahoo increased credibility among Microsoft’s search engineers. It still may be a losing battle, due to Google’s overwhelming dominance, but if anyone at Yahoo can spot areas of even small improvement — which can yield big returns — it could be Mayer. In addition, she can spearhead Yahoo’s own efforts to reverse — or perhaps simply stop — search market share declines via delivering a better consumer offering. That’s still heavy lifting, no matter the exec, since both Microsoft’s Bing and Google are better equipped to win here, too. And more: Mayer is under a time limit, since guaranteed payments Microsoft agreed to pay Yahoo for the shortfalls on what was promised will be running out next year. The pair has renegotiated that deal before, and it will likely have to do so again. Of course, Mayer could try to walk and threaten to take Yahoo’s search business elsewhere, a move that former CEO Scott Thompson was mulling before his ouster. That’s not a surprising ploy, except it is probably impossible to pull off, a fact acknowledged by top Yahoo execs. Indeed, especially since Google is the only choice of possible alternate partners and such a move is rife with major obstacles. There is the issue of the contract with Microsoft, which could lead to a potentially explosive legal struggle Yahoo can ill afford. And, there is the clear regulatory hairball any search hook-up between Google and Yahoo would lead to. That’s happened before, which Mayer knows well since she was a top exec in Google’s business when it tried to partner with Yahoo as a way to prevent Microsoft’s hostile takeover bid for the company. While times might have changed, Google is currently facing a likely battle with the Federal Trade Commission over its powerful search business, and trying to get Yahoo’s business now is a non-starter. Thus, finally fixing the Microsoft partnership is key to Mayer’s success since it represents a little over one-third of revenue of Yahoo (see the chart below). 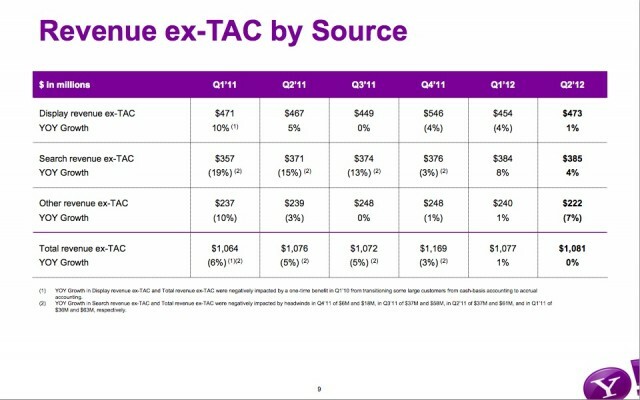 The bigger part of Yahoo’s business, as you can also see from the chart, has been display revenues. 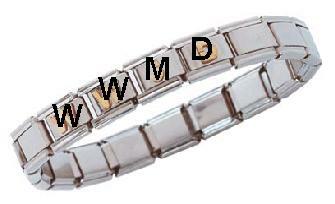 And that, too, has been a sorry tale of declines and ever more disappointing results. As is clear, the march downward for one-time leader Yahoo has been swift, and the prospects for the future are worse as Google and Facebook vie for leadership. The reasons for this have been myriad, but Mayer has apparently decided that it’s been due in large part to the broken Yahoo ad tech platforms and their ever weaker performance. As we have previously reported, she has determined that it’s now time to invest in improving them, both by funding internally and external acquisitions. For that, she has formed a tight group of execs to scan the landscape for tasty and innovative treats for Yahoo to gobble up. That includes: Scott Burke, SVP of Yahoo’s advertising and data platforms; Brian Silver, who runs the company’s Right Media Exchange; Xuhui Shao, a key engineering VP under Burke; and Mark Morrissey, the longtime tech exec who previously ran the company’s search business and was key to integrating the Microsoft search deal into place. The cerebral Burke especially has been pushing ad platform improvement for a while and finally seems to have won the battle against detractors of the big and possibly grandiose plan by appealing to Mayer’s interest in not giving up. Thus, the tabling of plans by Thompson, as well as interim CEO Ross Levinsohn, to outsource some of the automated parts of the display business to Google. Those talks were very serious, as well as others to sell off Right Media, but they are done for now. One major issue — the people in charge of the ad platform turnaround could also be seen (and most definitely are) as mired in Yahoo’s legacy of lackluster results and poor performance. “It is kind of funny that the guys responsible for the decline now have the responsibility for fixing it,” said one source at Yahoo. It’s a fair point to be made. But that’s water under the bridge, apparently, since the group has been making the rounds, helped by Yahoo’s M&A execs, with a wide range of companies in many different ad tech area being considered (and some dismissed), including: Mediaocean, Turn, Criteo, PubMatic and Millennial Media. Millennial is the most interesting, because it is a mobile ad play, where Yahoo is exactly nowhere (to be fair, less than nowhere) after years of botched efforts. As with other companies, this is a critical arena for Yahoo, and yet one more that Mayer needs to focus on. 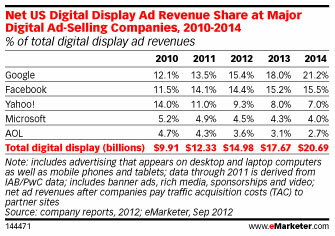 Lastly, Mayer has to make sure Yahoo’s premium display business remains strong. This is much more based on relationships with large advertisers than on major sponsorship and branding offerings, as well as creating consumer products and content that is appealing to marketers. This area is now headed up by former Google exec Michael Barrett, who has publicly said he was staying put for now at Yahoo as its chief of revenue. In fact, because he is in charge of all sales, he occupies the second slot under Mayer on Yahoo’s now strangely configured, punctuation-impaired and information-free management page. But numerous sources inside and outside Yahoo said Barrett has also told many people that he is still not fully committed to staying in the role for the long haul. If he eventually gets a lucrative exit package — something the new boss is not being very generous with overall, said sources — that will mean Mayer will need a high-profile and well-regarded ad exec to replace him; sources said Mayer has already begun reaching out to some candidates. The pickings are slim, with only a few names on the list of those capable of taking on such a job. That includes: Demand Media’s Joanne Bradford, who was also a former top Yahoo exec; Microsoft’s Yusuf Mehdi; OWN’s Kathleen Kayse; MLB.com’s Bob Bowman; and any number of Google execs. In that regard, as with all the other search and advertising overhaul efforts at Yahoo, it is a matter of attracting serious talent into the company going forward. More on that — and more — to come.